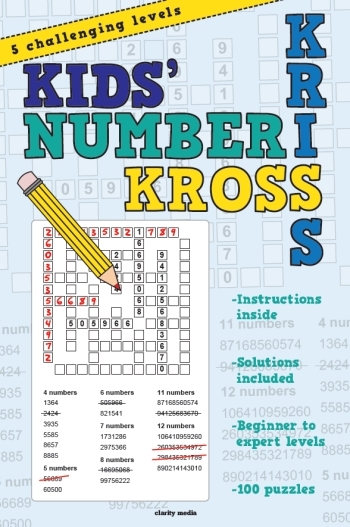 Welcome to this brilliant collection of 100 Number Kriss-Kross puzzles! The aim is simple, fill all grids with the number sequences given in the list at the bottom of the page. Puzzles gradually get more difficult as you work through the book, starting with level 1 and ending with level 5. 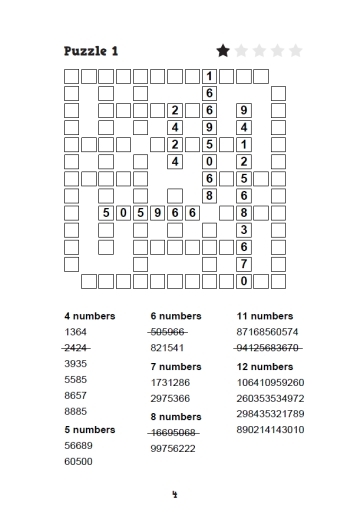 Can you become a number-placing genius and complete them all, from the relaxing to the super tricky? Full instructions are included and handy level guides are featured on each page. The beginner levels have a couple of the answers placed for you to get started. The last level has none placed! Can you solve them all? These puzzles are perfect for children of all ages, and even adults looking for something a little more relaxing! They are great for testing your eye for detail, and putting your memory skills to the test. There is only ever one solution to the grid, so every number sequence is sure to have only one position. Can you find and place them all? Each puzzle is printed at one per page, and grouped in order of difficult. With 100 puzzles and 5 levels, there's plenty to keep you busy and ensure that you are a number-placing genius upon completion! Answers are featured towards the back of the book so if at any point you get stuck and need a bit of help - take a peek there!